“The Ridge in A Bronze Mirror” is an allegory of contemporary archeology that takes the archaic medium of bronze mirror to project a speculative rhetoric, a topography of conflict and a whirlpool of untimely images. Unlike glass, bronze cannot produce a perfect representation; and the mirror could be an object carried over from the distant past as one brought back from a distant future. Designated as means of self-referentiality, “The Ridge in A Bronze Mirror” dwells on the unconsummated, in the hope of articulating the unspeakable of a certain locale. Zhou Tao spent nearly two years in an eco-industrial park at the foot of the Kunlun Mountains. The result is a rich repertoire of images that swiftly alternate between natural landscapes of sandstorms, dust clouds and the changing seasons, and realistic portraits of humans and other species fighting for survival in a state of exception. For the artist, every act of image-making is a direct confrontation with reality, and the perceptions, feelings and memories engaged by the filming process can be converted through and into images, which have the potential to connect the human eye with the body, and to revise a world heavily mediated by technology. Human agency is not only manifested in transforming the external world, but can also be exercised by preserving the internal, poetic space. The coupling of realism and romanticism creates a mesmerizing tension in Zhou Tao’s work. Commissioned by Times Museum, his latest works South of the Mountains and North of the Mountains, are both shoot by an 8K resolution camera, which meticulously combines the tactility of light and the machine's ISO sensitivity to capture shades of brightness and darkness beyond the capacity of the human eye – it is the artist’s radical attempt to ecologicalize the body of the filmmaker as well as filmmaking technologies. Within the confined space and time of the exhibition, “The Ridge in A Bronze Mirror” invites the spectators to dive into the illuminated surface of the screen to experience the affective intensity of image-making and processing: as technology becomes extension of our body and perception, can the act of shooting preserve its sense of intuition? 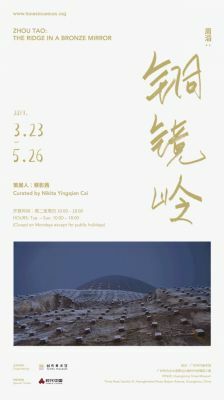 Times Museum is hosting the first solo survey of Zhou Tao with a comprehensive selection of his works produced in the past decade. It is also the public premiere of two new films South of the Mountains and North of the Mountains commissioned by Times Museum. Times Museum has launched Prospect as series of solo surveys which introduce academically celebrated, mid-career artists to broader audiences at home and abroad. It is scheduled to be on view in the prime time of March every year. Led by the museum’s curatorial team, Prospect offers sufficient institutional support for artistic research and experiment, with focus on tempo-spatial strategies in response to the context of Times Museum.